R. Michael Meneghini, MD is a nationally-renowned orthopaedic surgeon specializing in total joint replacement, partial knee replacement, and outpatient joint replacement surgery. 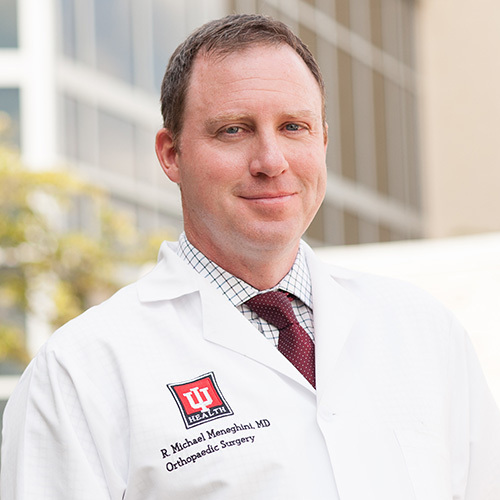 He has been named among the top 22 knee surgeons in North America, and has been selected as an Indianapolis Top Doctor for 7 consecutive years. Dr. Meneghini received fellowship training in complex hip and knee replacement at the world-renowned Mayo Clinic and participates in orthopaedic research to improve surgical techniques and improve outcomes for patients. Dr. Meneghini and his staff are dedicated to providing the highest quality of medical and surgical care for patients needing hip and knee replacement. Our goal is to consistently provide an unparalleled level of care to all of our patients, making sure you feel well-informed and supported throughout your surgery and recovery process. We would be honored to treat you and your family and look forward to helping you.